There’s nothing like washing clothes in a laundromat to jostle our perspective on the things we take for granted. Things like dumping your clothes everywhere to sort them, not searching for coins to feed the washer AND dryer, and not having to hang around a public laundry area with complete strangers amid commercial-dryer high humidity. 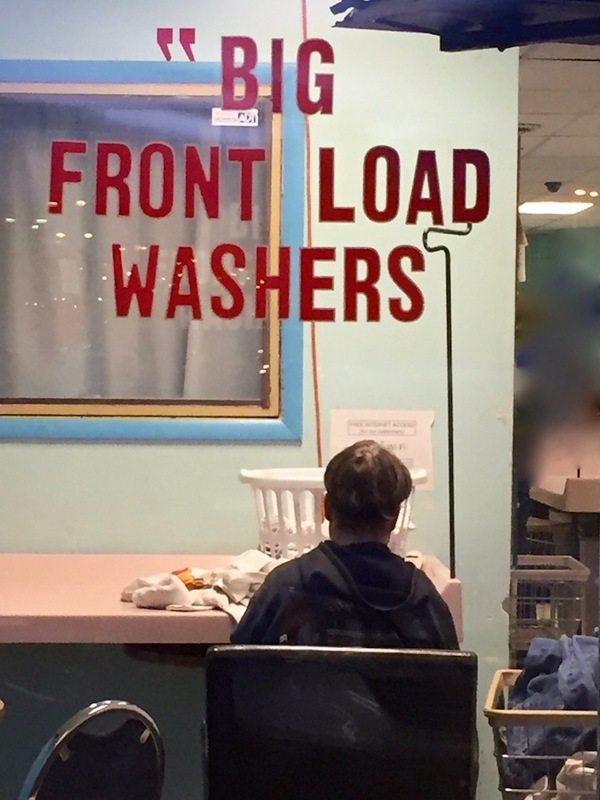 Three years ago in March, I encountered a profound experience at a local laundromat. The memory of that afternoon still raps against my heart and reminds me to slow down and not take my blessings of convenience for granted. Let’s pick up the story . . . . Recently, I whipped to the closest coin laundry to wash a couple of dog beds and an old comforter. I was zipping along cramming the bulky items into one of those advertised “big front load washers.” But the door would not latch shut after I swiped my credit card (it’s still called a coin laundry, but plastic payment was a faster choice). Rats! “Do you work here?” I quickly inquired. “No,” he mumbled, continuing to stare at his magazine. I rolled my eyes and partially huffed back to the broken washer, when this man’s voice pierced my irritated mood. “That’s why I always use the top loaders,” he offered. Now someone tells me! I bemoaned to myself. I found the coin laundry’s phone number online via my cell phone and talked to the real owner about my credit card charge for a machine I couldn’t use. Between my washer and dryer trips, I retreated to my vehicle, but watched the diminutive man through the front window return to his spot at the side table. Painstakingly, he folded his white tube socks and blue towels, his cane resting on his laundry cart. There’s nothing like washing clothes at a laundromat to jostle our perspective on the things we take for granted. Oh, if only I’d stay attuned to the everyday people who can jostle my perspective for good. People who remind me that I can bend and not break no matter how inconvenient, tiresome, or painful my life circumstances get. What everyday people have you met lately that have nudged you to count your blessings? Were they in a meeting with you? Next to you in the doctor’s office? Across the street with the “Lost Job. Please Help” sign? Or, in your home eating a meal with you? As I’ve discovered, both complete strangers and the closest family and friends can help jostle our perspective. But are we willing to stop and notice? And are we willing to stay both humble and grateful for the life lessons they have to share about bending and not breaking? I for one am willing to go back to the laundromat and take along plenty of quarters, mainly to find this gentlemen and buy him a couple of orange sodas and hear how his week is going. Wanna join me?